Contemporary Problems of Ecology is a multidisciplinary periodical that publishes original works on the following subjects: theoretical and methodical issues of ecology, regional aspects of ecology, regional ecological disasters, structure and functioning of ecosystems, anthropogenic transformation of ecosystems. All basic aspects of modern ecology, including the most complicated interactions between living organisms and their environment, are presented. Some of the journal issues are dedicated to global changes in biological diversity at various levels of organization (populations, species, ecosystems) principles and methods of nature conservation. 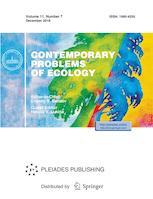 Contemporary Problems of Ecology is a peer reviewed journal. We use a single blind peer review format. Our team of reviewers includes 91 reviewers, both internal and external (88%). The average period from submission to first decision in 2017 was 15 days, and that from first decision to acceptance was 30-40 days. The rejection rate for submitted manuscripts in 2017 was 76%. The final decision on the acceptance of an article for publication is made by the Editor-in-Chief.